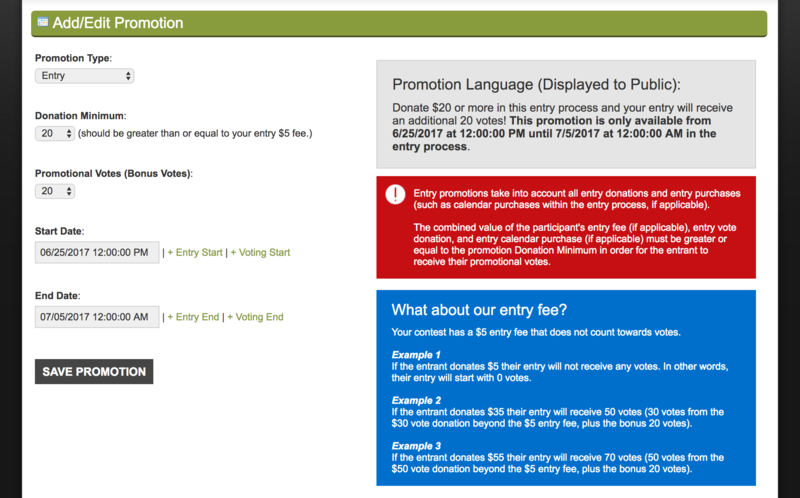 The Promotions Module allows you to run an entry promotion within your contest, where entrants receive "bonus" votes during the entry process. 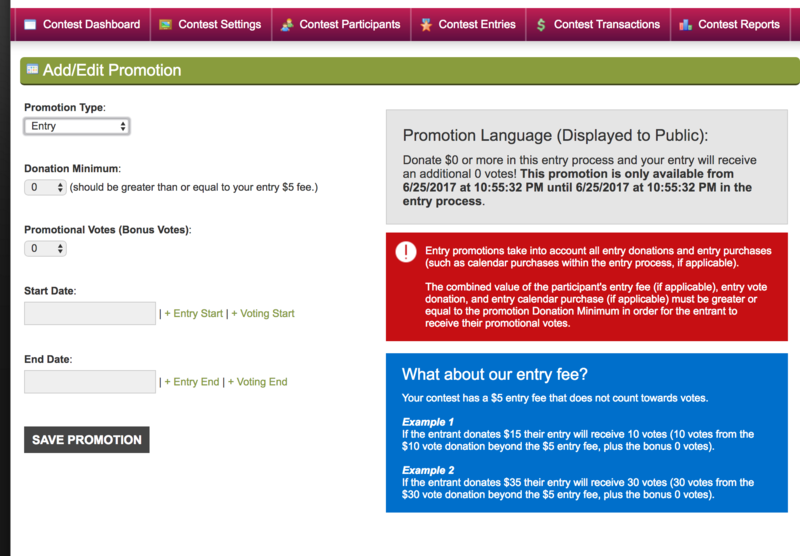 You can choose the minimum donation required, how many bonus votes they receive, and the length of time that the promotion runs. 1. 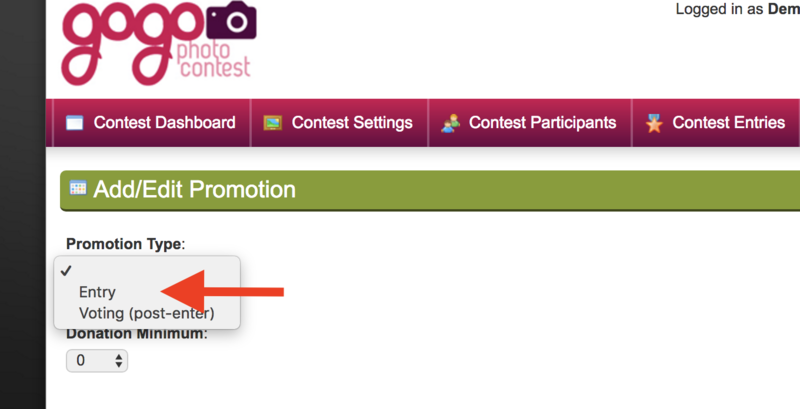 ANY CONTEST CAN RUN AN ENTRY PROMOTION. With or without a required entry fee. 2. ENTRY FEES (IF APPLICABLE) DO NOT COUNT TOWARD VOTES. Ever. With or without an entry promotion. 3. ENTRY PROMOTIONS TAKE INTO ACCOUNT ALL ENTRY DONATIONS AND ENTRY PURCHASES (SUCH AS CALENDAR PURCHASES WITHIN THE ENTRY PROCESS, IF APPLICABLE). The combined value of the participant's entry fee (if applicable), entry vote donation, and entry calendar purchase (if applicable) must be greater or equal to the promotion Donation Minimum in order for the entrant to receive their promotional votes. 4. ENTRIES ENTERED OFFLINE, BY THE CONTEST ADMIN, DO NOT AUTOMATICALLY RECEIVE BONUS VOTES. YOU (THE CONTEST ADMIN) MUST APPLY THE BONUS VOTES USING OFFLINE VOTING (INSTRUCTIONS HERE). Donation Minimum: The minimum donation an entrant is required to make in the entry process in order to qualify for the bonus votes. 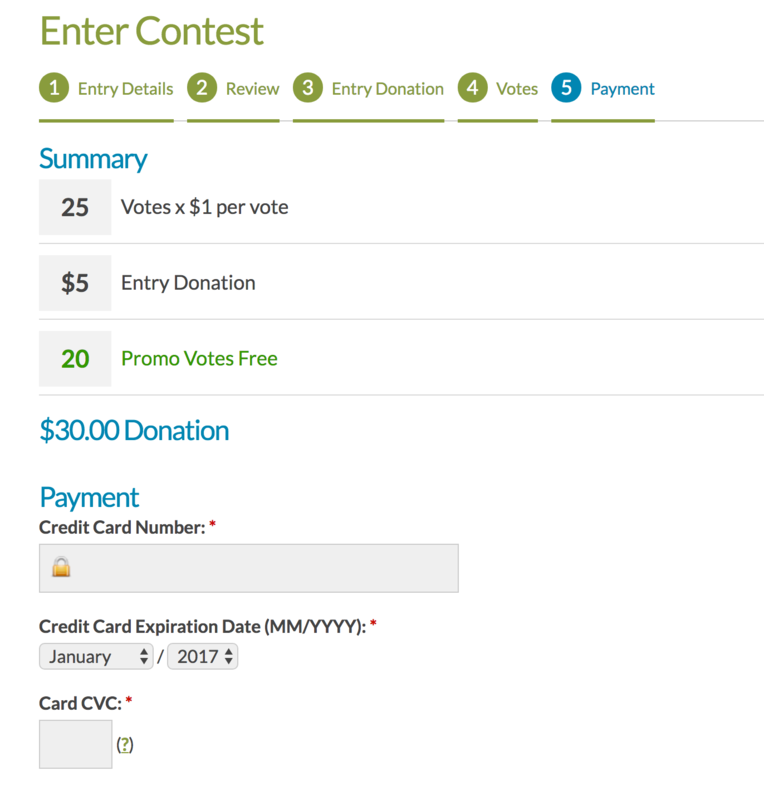 Promotional Votes (Bonus Votes): The amount of bonus votes an entrant receives for making the donation minimum. 6. 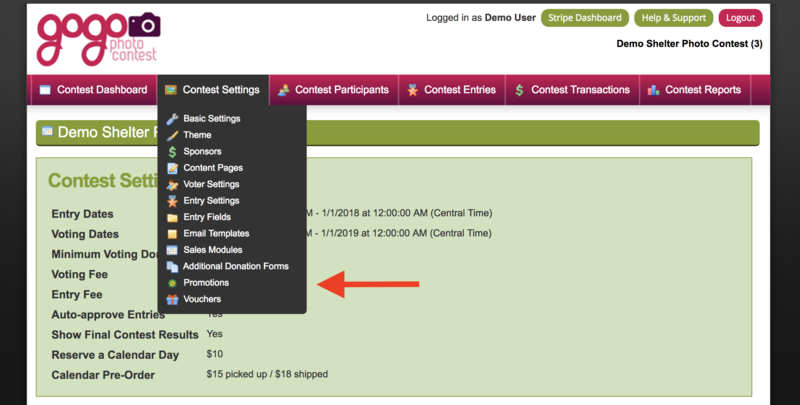 As you fill out the fields, the language in the PROMOTION LANGUAGE (GRAY BOX) will update. This is what is displayed to entrants during the entry process. The language within the BLUE BOX (What about our Entry fee?) will also update. Since entry fees (if applicable) do not count toward votes, this helps you to calculate how many bonus votes an entrant might receive under various scenarios. They have made a $30.00 donation. Of this $30.00, they'll receive 25 regular votes (since the $5.00 entry fee does not count toward votes), and 20 bonus votes. Our entrant has received a total of 45 votes.